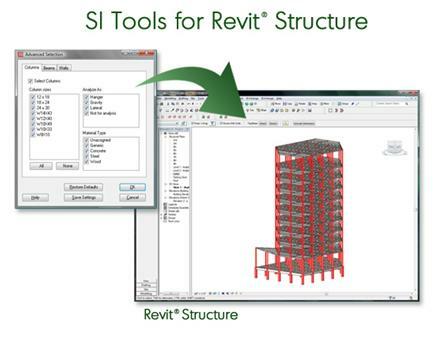 SI Tools for Revit® Structure is a Revit Structure add-in that provides advanced selection capabilities for structural members. Use the toolbar buttons to quickly select all beams, columns, or walls on a single level or in the entire model, regardless of type or material. Or use the Advanced Selection options to select a custom combination of beams, columns and walls. Want to identify all 8X10 members, both beams and columns? Or select all concrete members, regardless of size? Or do you need to quickly find all members designated "not for analysis"? It is easy with SI Tools for Revit Structure.